Actually, no. We just found these guys at the Marlton Trader Joe's store. We were super excited. Apparently they do sell them on the east coast now. 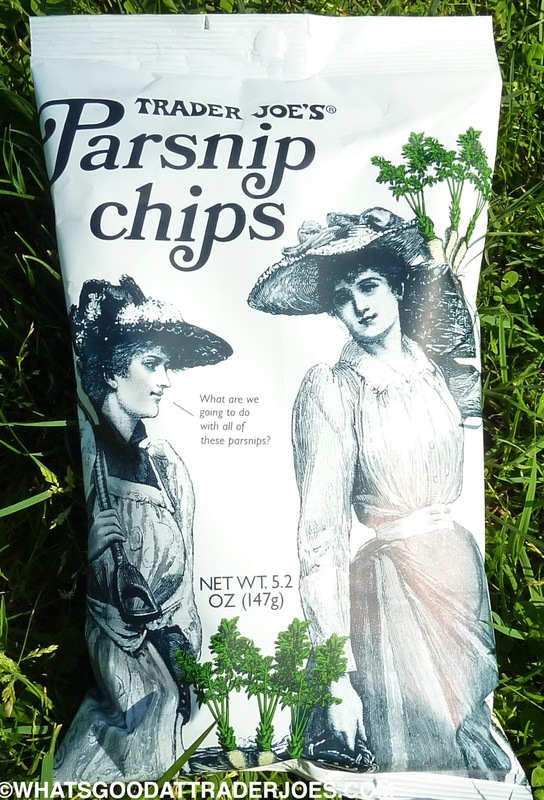 So to continue our streak of interesting root vegetable products featuring beets, jicama, and now parsnips, let's take a look at these unusual chips. In appearance and texture, they're not unlike sweet potato chips I've tried. They're not quite as yellow/orange as that, though. I'd say they're a tad more pale, but there is an amber hue to them. They're definitely salty, but they're also much sweeter than I expected them to be. Maybe it's because I haven't had a plate of parsnips in a while, but I didn't think I'd be getting much natural sugariness at all. I checked the ingredients for some kind of sweetener. Nope. Just parsnips, oil, and salt. So...parsnips are naturally sweet. Who knew? (Most of our readers, probably.) But this foodie-hack sure didn't. It also says so on the back of the bag, but I rarely read those things before wolfing down a good portion of the product first. 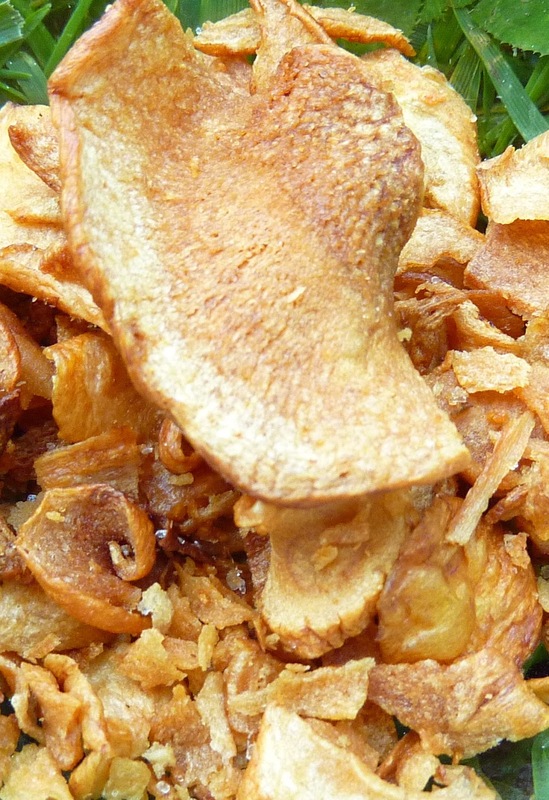 They're beautifully crunchy and firm and just slightly oily and salty to the touch. There's just the tiniest hint of leatheriness, for lack of a better term. It's not at all unpleasant, though. If anything, the consistency of these parsnip chips is more pleasant than regular potato chips. Flavor-wise, they're somewhere in between sweet potatoes, regular potatoes, carrots, and bananas—there's also a distinct similarity to plantain chips. There's a subtle earthiness involved, but it's mostly just a salty, sweet, delightfully snackable taste. Four stars a piece from Sonia and me. Don't like lily chips but like the sounds of leathery ones. Nutritional panelists deceiving since there's almost no sugar and low in salt! Great choice for low carb dieters. sounds good! I'll give 'em a go. If I can find them. Yes, parsnips are naturally sweet. I'm excited to try these. Hopefully, they've got them in the middle of the country as well as on the coasts now. Parsnips are closely related to carrots, I believe, which would explain both the sweetness and mild leathery-ness of the parsnip chips. I'll give them a try if I see them around here! Bought and tasted. These are really good, not greasy at all, subtly sweet. Remind me a bit of taro chips. Seem a bit pricey at $3/bag, but they are healthier than pretty much any other chip I've seen, and great for my low-carb "diet." Just tried these and they are GOOD. $3 a bag but it's a good sized bag. Very good with cheddar, bacon and ranch dip!